Tim on the Treasure Coast of Florida asked me how best to search a cut beach, so here are my three golden rules of searching eroded (Cut) beaches. 1. Search the jewelry and coin trap first. If you see an obvious cut running along the beach, always search along the base of the cut first giving yourself a chance to detect the easy to recover targets. The base of a cut beach helps to trap jewelry and coins in place, especially if the water is going out after the previous high tide. Coins, bottle caps or pull tabs laying on top of the sand close to the base of the cut is an excellent sign on eroded tourist beaches. The first few yards closet to the cut is often the most productive area, as objects hit the back of the wall of sand. In heavily hunted areas, searching a cut should not become a foot race to see who can cover the area the fastest. Targets are often shallow and easy to detect, so you do not want to walk over easy to detect targets using hasty and sloppy search techniques. Some targets may be deeper, taking your time will insure you have a chance of detecting both shallow and deep targets when searching a cut beach. I recommend using a medium size search coil on eroded beaches, giving you the best combination of sensitivity to small shallow targets and large deeper targets. When a beach is eroded you often only have a short window of opportunity before the following high tides bring sand back in over the area. I try to stay searching an eroded stretch of beach for as long as I possibly can, just in case that is my best shot at detecting jewelry or coins in the area. During perfect beach hunting situations is not the time to find out you are not prepared, spare charged batteries and a change of search coil should be readied as soon as you know your local beaches may be impacted by a coastal storm or unusually high winds or surf. 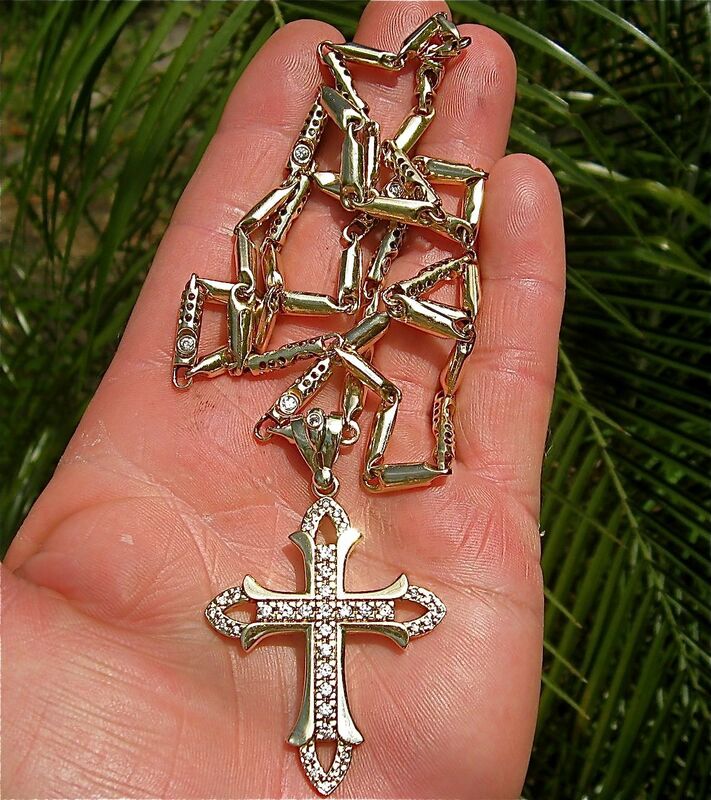 This diamond chain and cross is the type of easy to detect shallow target you can detect after high surf strips sand off a beach popular with sunbathers and swimmers. The gold cross and chain was all balled up when first found, I could have easily missed this fine piece of bling rushing to try and cover the cut as other local beach hunters were in the area. The slower and more methodical you cover a cut, the more chances you have of making the most of one of mother natures best beaching hunting opportunities.